Middle-ear barotrauma is the accumulation of fluid and blood in the middle ear or rupture of the eardrum as a consequence of failed equalization of pressure in the air space of the middle ear during diving or flying. The air pressure in the tympanic cavity­ — air-filled space in the middle ear — must be equalized with the pressure of the surrounding environment. The Eustachian tube connects the throat with the tympanic cavity and provides passage for gas when pressure equalization is needed. This equalization normally occurs with little or no effort. Various maneuvers, such as swallowing or yawning, can facilitate the process. An obstruction in the Eustachian tube can lead to an inability to achieve equalization particularly during a descent when the pressure changes fast. If the pressure in the tympanic cavity is lower than the pressure of the surrounding tissue, this imbalance results in a relative vacuum in the middle ear space. It causes tissue to swell, the eardrum to bulge inward, leakage of fluid and bleeding of ruptured vessels. At a certain point an active attempt to equalize will be futile, and a forceful Valsalva maneuver may actually injure the inner ear. Eventually, the eardrum may rupture; this is likely to bring relief from the pain associated with MEBT, but it is an outcome to be avoided if possible. Factors that can contribute to the development of MEBT include the common cold, allergies or inflammation — conditions that can cause swelling and may block the Eustachian tubes. Poor equalization techniques or too rapid descent may also contribute to development of MEBT. Divers who cannot equalize middle-ear pressure during descent will first feel discomfort in their ears (clogged ears, stuffed ears) that may progress to severe pain. Further descent only intensifies the ear pain, which is soon followed by serous fluid buildup and bleeding in the middle ear. With further descent, the eardrum may rupture, providing pain relief; this rupture may cause vertigo, hearing loss and exposure to infection. 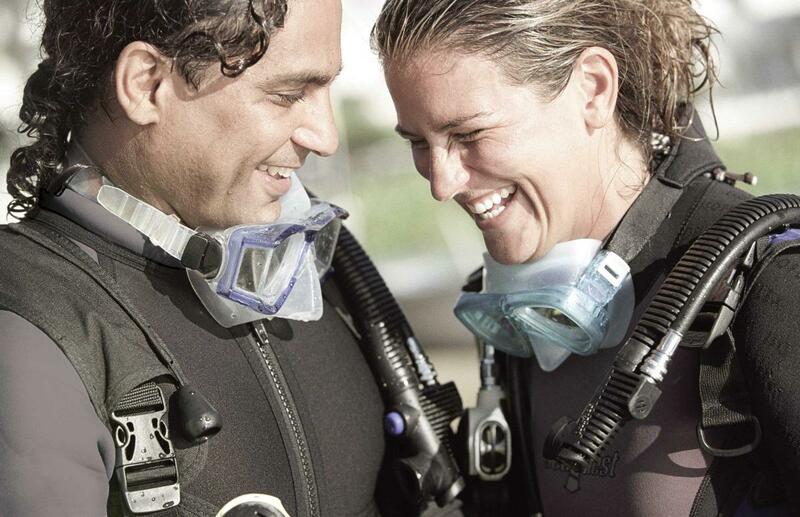 While diving: When feeling ear discomfort during descent, you should stop descending and attempt equalization. If needed, ascend a few feet to enable equalization. If equalization cannot be achieved, you should safely end the dive. First aid: When feeling fullness in one's ears after diving, abstain from further diving. Use a nasal decongestant spray or drops. This will reduce the swelling of nasal mucosa and Eustachian tube mucosa, which may help to open the Eustachian tube and drain the fluid from the middle ear. Do not put any drops in your ear. Treatment: Seek a physician evaluation if fluid or blood discharge from the ear canal is present or if ear pain and fullness lasts more than a few hours. If vertigo and dizziness are present, which may be a symptom of inner-ear barotrauma, you should seek an urgent evaluation. Severe vertigo and nausea after diving require emergency medical care. Return to diving may be considered if a physician determines that the injury is healed and the Eustachian tube is functional. Do not dive with congestion or cold. Descend slowly. If unable to equalize after a few attempts, safely end the dive to avoid significant injury that may prevent you from diving the rest of the week.